Ovarian cancer is a deadly disease that usually diagnosed in advanced stage with a poor prognosis. A woman’s lifetime risk of developing ovarian cancer is around 2%. About 10-15% of those cancers are familial or genetic in origin. Among them mutations in BRCA genes (which code for DNA damages repair) are the most common and also expose their carriers to other types of cancer (breast cancer, prostate cancer, gastrointestinal cancers, laryngeal cancer, eye malignancies, melanoma). The lifetime risk of ovarian cancer in a carrier of one of the known mutations in BRCA genes is 15-75%! These cancer tend to attack 10 years earlier than the average, so the risk start to increase in the 5th decade of life. Therefore, carriers are considered very high risk population. The way of inheritance these mutations is autosomal dominant, means that half of any carrier’s offspring will also have the mutation. Women and Men can both carry these mutations, though types of cancer are different between them. However, it should be emphasized that male carriers have also high risk of developing breast cancer, which is very rare among the general population. The risk of being a carrier is varying between different populations. There is an increase prevalence of carriers among Ashkenazi Jews and Islandic women. Until today more than 200 mutations were identified, 3 of them are typical to Ashkenazi Jews. 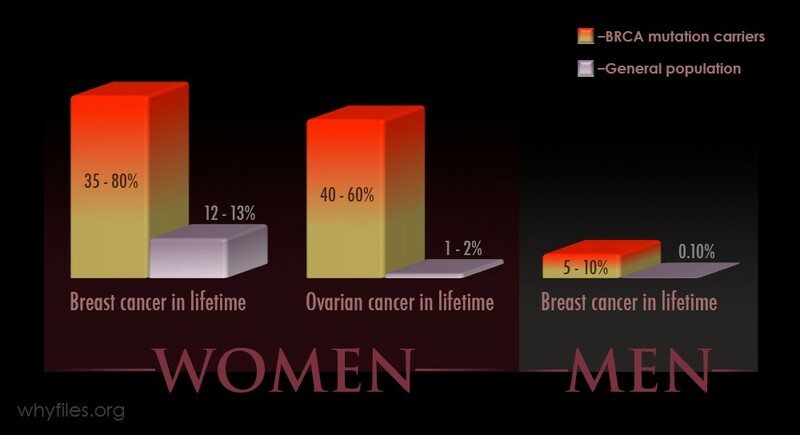 The risk of carrying one of them among these women is 2.5%, meaning that 1 out of every 40 Jewish Ashkenazi women is a carrier and thus having much higher risk of developing ovarian cancer and breast cancer. Who should be genetically tested? Every man or woman with a family history of breast or ovarian cancer, especially if it happened earlier than the average. Rabin Medical Center is in full support of cancer research and genetic testing for the BRCA gene. Since early detection is currently the best tools for survival among this high risk population, the Rabin Medical Center has established the ONLY special clinic in Israel to perform this testing to lead to the treatment and prevention of cancer. 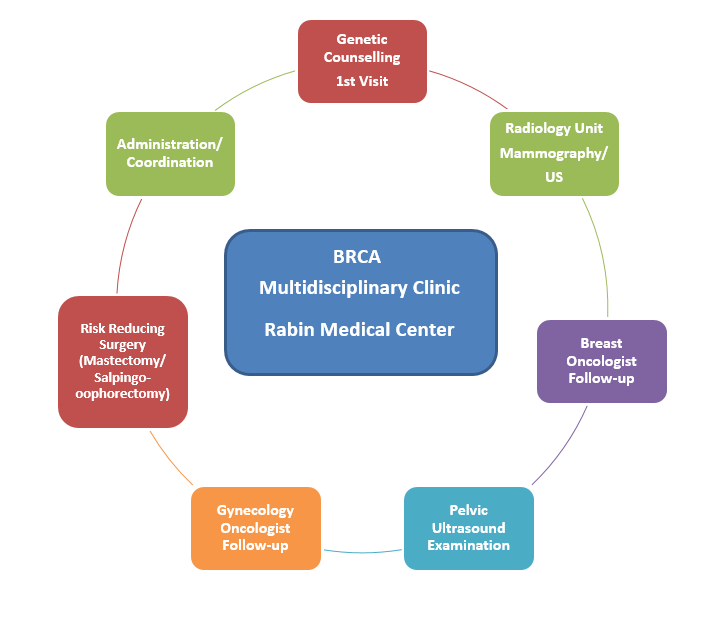 The BRCA Multidisciplinary Clinic was founded to serve patients with a high risk of cancer at Rabin Medical Center’s Davidoff Cancer Center—a world class facility whose sole focus is on the treatment and prevention of cancer. The results of this genetic test make a significant difference in the lives of people at high risk for cancer.Our BRCA outpatient (but in hospital, RMC) clinic is a unique multidisciplinary one whose objective is to raise awareness, to prevent ovarian cancer and to early diagnose this devastating disease in order to improve care. We recommend every carrier patient to undergo what we call risk-reducing bilateral salpingo-oophorectomy after completing childbearing and around the age of 35-40 years. After this minimally invasive surgery (laparoscopy) the baseline risk is decreased by 96%! No doubt that awareness, screening and follow-up can save lives. 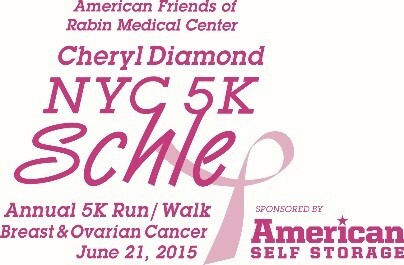 Join us in the fight to help prevent breast and ovarian cancer in our annual our fifth annual Cheryl Diamond NYC 5K Schelp Walk on Sunday, June 21st 2015. Throughout their lifetimes, one in seven women will be diagnosed with breast cancer and over 22,000 women will be diagnosed with ovarian cancer annually.